The year 2017 has been full of disasters, from the devastation wrought in Puerto Rico by Hurricane Maria to the wildfires ravaging much of California, Oregon, and surrounding states. Tornadoes continue to destroy homes throughout the Midwest and Southeast, while blizzards can always be counted on to make a mark during Northeastern winters. So what can homeowners and renters do about dealing with these natural disasters without panicking? It turns out the combination of the right insurance services and some proactive precautions go a long way in preparing you and your loved ones for any natural disasters. Natural disasters cause a wide range of health problems, from short-term emergencies like broken tree limbs or burns to long-term effects of smoke inhalation or elevated stress levels. Accessing affordable health care after an emergency is always easier with a good health insurance plan. The national enrollment period began in November, 2017 and ends on December 15, 2017, so make sure you take time to sign up for an individual or family plan before it’s too late. 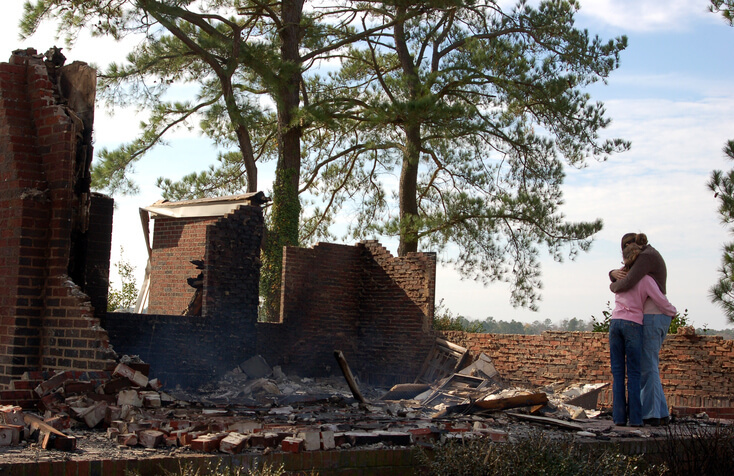 Few people wait for emergencies to happen before getting insurance like standard homeowners and auto policies, but the idea of a specialty plan like fire insurance is often forgotten until there’s smoke on the horizon. All policies come with a delay on benefits, so you’ll need to start a plan between 30 and 90 days before an emergency or natural disaster in order to make a claim. A renters policy also comes with similar limitations, even though it covers only your belongings. Flood insurance is especially recommended, regardless of where you live. Homeowners and renters in very low risk areas pay a low annual premium and have peace of mind, while those who live in higher risk areas can still find affordable insurance plans. It’s one of the most important insurance services because flood damage can cost thousands of dollars to repair. Check your community and state emergency organizations for training opportunities. Many groups host local workshops to train homeowners on topics including assessing the damage of a structure, avoiding hazards like downed power lines and leaking gas pipes, and first aid that comes in handy all year round. The American Red Cross, FEMA, and even local libraries often run these programs in order to help all community members feel prepared for a disaster. You don’t need 50 pounds of beans and an industrial can opener, but you and your family can benefit from having a stock of basic goods at home. It’s recommended that you store at least three to five days worth of non-perishable and easy to eat foods. Most canned foods fall under these guidelines, as do many ready meals that are sold on store shelves. You should also keep enough bottled water at home to ensure a three-day supply for each family member. Don’t forget to rotate these foods regularly – use them up and replace them every year or so. No one wants to snack on stale granola bars when the power’s out. Freeway Insurance offers every type of insurance service you could need. Call us today at 800-777-5620 or stop in to speak to one of our friendly insurance agents.